On November 22, 2017, the federal government released their long-anticipated National Housing Strategy, the first of its kind in Canada. Through this document, the government has outlined an ambitious $40 billion plan that aims to build 100,000 new units, repair and renew 300,000 units, protect the affordability of 385,000 households currently supported in subsidized units and lift 530,000 Canadians households out of core housing need. After 20 years without significant investment in housing, this long overdue Strategy is a historic step in the right direction. We are pleased that the government has adopted several of the recommendations made by ONPHA, and that they have recognized the critical role the community non-profit housing sector plays in ensuring all Canadians have an affordable, quality place to call home. Some details and agreements have yet to be presented or finalized, perhaps most notably that a large portion of the funding for programs announced in the Strategy will depend on provincial and territorial cost-sharing agreements that have yet to be reached. But overall we believe that the federal government is on the right track. and a commitment towards new tenant based initiatives and public engagement campaigns. We look forward to identifying how ONPHA and our members can be involved and engage with these new initiatives. We will be looking to the 2018 Federal Budget to see how these initiatives will be funded, and whether they will fall under the mandate of CMHC. The National Housing Strategy has a major focus on repair, regeneration and expansion of affordable housing. According to the federal government, up to 100,000 units will be developed and 300,000 will be repaired or renewed over the next 10 years. This will primarily be done through two initiatives – a new $15.9 billion National Housing Co-Investment Fund and a $2.5 billion Federal-Provincial/Territorial Fund which we understand to be the successor to the current Investment in Affordable Housing (IAH). The new National Housing Co-Investment Fund will be delivered through a combination of $4.7 billion in financial contributions, and $11.2 billion in low-interest loans. It will incorporate previously announced initiatives including the Rental Construction Financing Initiative, the Affordable Rental Innovation Fund and federal government’s commitment to transfer surplus lands to community and affordable housing providers. Applications will be open as of April 1, 2018 and ONPHA will be working to ensure that our members have all the details they need in advance. We expect additional details from the federal government soon. The sector’s strong advocacy efforts aimed at maintaining affordability at the End of Operating Agreements have paid off. The National Housing Strategy includes two distinct programs aimed at existing provincially and federally administered stock. The program that will apply to ONPHA members is the Canada Community Housing Initiative which, through a $4.3B investment will support provinces and territories as they protect and build a sustainable housing sector. Using past allocations as a guide, we can expect that Ontario could see approximately 35%, or $1.5B, of this funding. It’s important to note, however, that provinces will need to commit to matching this funding in order to be eligible. Efforts aimed at preserving existing stock aren’t just in the form of direct funding. Through the National Housing Strategy, the federal government has also committed to revisiting the Social Housing Agreements with the provinces in order to give housing providers flexibility to access loans before their operating agreements end. Specifically, the Strategy identifies that this includes eligibility to access new loans under the National Housing Strategy to help repair housing stock and support sustainability, as well as eligibility to apply for funding through the current IAH which runs until March 31, 2019. Ontario’s approach has been to ensure housing providers have Service Manager approval for initiatives like this, so expect this approach to continue. Several questions remain about initiatives in this area. For one, we do not yet know when funding through the Canada Community Housing Initiative is expected to flow, or about the role of Service Managers in the distribution of this funding. We will also be seeking information about when the Canada-Ontario Social Housing Agreement will be modified and how the Province will want to approach these changes with Service Managers. After months of speculation about whether it would be included, the National Housing Strategy took the major and unprecedented step of introducing a new portable housing benefit for Canada. The federal government estimates that the new Canada Housing Benefit will grow to support up to 300,000 households and will launch as early as 2020. ONPHA has long-advocated for the use of a variety of approaches to housing assistance, including a portable housing benefit. We believe that, if designed well, this could be an important tool for increasing affordability and reducing core housing need in Ontario and across the country. All eyes will be on the 2018 Federal Budget to see how funding will flow for this initiative. Through the Strategy, the federal government has committed to reducing chronic homelessness by 50% over the next 10 years. To do so, they have committed $2.2 billion towards an expanded and redesigned homelessness program that will launch in April 2019 (when the current Homelessness Partnering Strategy is set to end). The Strategy stresses that the new program will focus on responsive strategies, as well as preventative strategies that stem the flow of individuals into homelessness. This could signal increased supports and resources for housing providers, particularly supportive and transitional providers, and we look forward to seeing how the Advisory Committee on Homelessness steers the redesign of the national homelessness program. There are several things missing from the National Housing Strategy. First and foremost, it confirms that the federal government is still in the process of developing a separate Indigenous Housing Strategy. It is critical that the federal government gets this right. To do so, they must ensure that the Indigenous Strategy is driven and informed by Canada’s Aboriginal populations, and that it recognizes their diverse situations and circumstances. It will be imperative that the perspectives of urban and rural Aboriginal housing providers are sought out and reflected in the forthcoming Strategy. 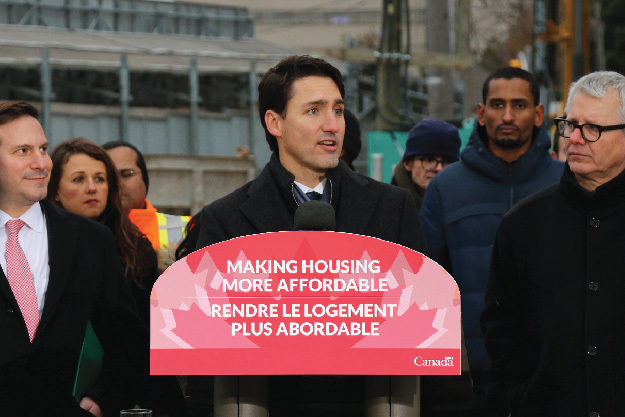 The clear recognition of this within the National Housing Strategy, as well as the acknowledgement that Prime Minister Trudeau made at the official announcement leaves us cautiously optimistic that the federal government is on the right track. ONPHA will continue to work closely with our Urban Aboriginal Housing Advisory Committee as the federal government moves forward with consultations to ensure that the perspectives of Ontario’s urban and rural Aboriginal housing providers help drive the Strategy. As previously highlighted, we are also waiting on a redesigned homelessness program, as well as a finalized cost-sharing agreement with the Province of Ontario. The development of the National Housing Strategy has been decades in the making and it is critically important that the federal government gets the rollout right. As we learn more about the Strategy and its initiatives, we look forward to working with our members, as well as with Ontario’s Ministry of Housing as they begin consultations around modernization of the provincial non-profit housing sector in the context of this new Strategy. Over the coming weeks and months, ONPHA will be releasing more detailed responses and communications about the components of the National Housing Strategy and what they mean for our members. Don’t miss our webinar Navigating the National Housing Strategy: The Community housing lens on January 11, 2018. Join ONPHA’s Deputy Executive Director Margie Carlson for a review of the Strategy and what it could mean for Ontario’s housing providers and ONPHA’s members. Register today.